Thank you for downloading this free sample! 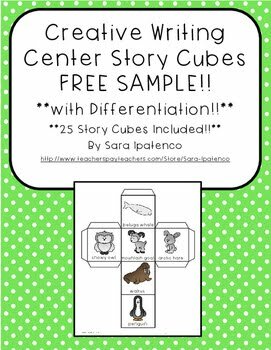 The full set is a set of story cubes, by Sara Ipatenco, designed to make writing enjoyable and engaging for your students. Each cube features six images with a common theme. Students roll the cube until they’ve rolled three different images, which they write on the included recording sheet. Then, using the three images, students write a story. This is a great way to differentiate writing by allowing emerging writers to write fewer sentences while encouraging above level writers to write more sentences. I’ve included an easier writing page with fewer lines and room for a picture and a more advanced writing page with more lines to write. This packet also builds reading, creative thinking and handwriting skills! The full set includes a total of 50 story cubes – 25 cubes in color and the same 25 cubes in black and white. ENJOY! !